Community gardens are either individual plots or collectively cultivated gardens, and there is often some form of public ownership (Jermé & Wakefield, 2013). There are various levels of commitment from local citizens. For example, NeuLand, a community garden in Cologne, Germany is run by a charitable organization with five paid staff members, a managing committee, about 20-30 committed gardeners, and about 40 occasional gardeners (Follmann & Viehoff, 2014). In the Western World, community gardens have become popular because they are often viewed as a way to advocate for sustainable social and ecological change through a bottom-up approach (Follmann & Viehoff, 2014). Thus, they have proven to have an important impact on the health of citizens in various regions. Community gardens have specifically increased access to healthy foods in marginalized regions, consequently, alleviating issues of food poverty (Jermé & Wakefield, 2013). In order to increase the consumption of fresh vegetables, the Victory Garden program was founded in the United States during World War II (Armstrong, 2000; Chan et al., 2015). This led to a 40 percent increase in the consumption of fresh vegetables (Armstrong, 2000). Today, community gardens are still used to ensure that everyone has equitable access to fresh produce. One study revealed that households who did not participate in community gardens consumed fruits and vegetables 3.3 times per day (Alaimo, Packnett, Miles, & Kruger, 2008). In comparison, households with an individual involved in community gardens had a daily consumption rate of 4.4 (Alaimo et al., 2008). When community gardens are properly implemented and utilized, they can be an important source of empowerment for local citizens (Follmann & Viehoff, 2014). They can provide a space for productive work, interaction with each other, intercultural engagement and knowledge exchange (Follmann & Viehoff, 2014; Armstrong, 2000; Chan et al., 2015). Thus, they become a symbol of unity and increase neighborhood pride (Armstrong, 2000). This social capital is important to increase psychological support (Chan et al., 2015). As a result, community gardens have been established as a component of health promotion (Armstrong, 2000). Overall, the focus on community gardens is to foster a greater quality of life and community rather than consumption and individualism (Follmann & Viehoff, 2014). In order to continue to foster sustainable community gardens, policy development processes must be examined (Jermé & Wakefield, 2013). Local citizens must be able to participate in the development of policies, and the policies must ensure that citizens have access to gardens that are fairly allocated (Jermé & Wakefield, 2013). Success also depends on a collaborative approach between the various government agencies involved (Jermé & Wakefield, 2013). Urban populations have always been exposed to ambient (outdoor) air pollution because urban regions have high-density industries and populations (Dannenberg et al., 2011). High levels of pollution result from the concentration of sources of combustion (Dannenberg et al., 2011). There are two types of pollutants: primary and secondary. Primary pollutants are those that are directly emitted (Dannenberg et al., 2011). These include sulfur dioxide, which is released from power plants, and carbon monoxide from fossil fuel combustion (Dannenberg et al., 2011). In contrast, secondary pollutants result from the physical and secondary conversion of other pollutants (Dannenberg et al., 2011). Tropospheric ozone is one example; it forms through the chemical reactions of anthropogenic and biogenic precursors (Dannenberg et al., 2011). Both primary and secondary pollutants lead to negative health consequences, including eye irritation, fatigue, headaches and more severe effects such as bronchoconstriction, lung impairment and neurological damage (Dannenberg et al., 2011). Certain populations are particularly vulnerable to ambient air pollution. For example, as a result of physiological and psychological factors, children are more sensitive to ambient pollution (Vanos, 2015). Furthermore, those with less education and lower socio-economic status also face a greater risk of exposure to ambient air pollution; thus, highlighting pollution an issue of environmental justice as well (Dannenberg et al., 2011). Since air pollution is multifaceted, it is not easy to determine a solution. More research is required, to determine the severity of ambient air pollutants in different regions and how different populations are impacted. Furthermore, it is important to develop and implement policies that will reduce the prevalence of ambient air pollutants and their health consequences. For example, in order to provide evidence-based advice on the impacts of air pollution on health, the WHO Regional Office for Europe developed two projects-the “Review of Evidence on Health Aspects of Air Pollution” (REVIHAAP) and the “Health Risks of Air Pollution in Europe” (HRAPIE), which were completed in 2013 (WHO, 2013). The findings from these projects guided changes in the EU air quality policies that were implemented that same year (WHO, 2013). The built environment also plays an important role in mitigating air pollution. Regions should employ sustainable development practices to ensure energy-efficient land use and transportation systems to reduce emissions (Dora et al., 2015). Moreover, attention should be given to the proximity of homes and schools to sources of pollution (Dannenberg et al., 2011). Urban Structure Types (USTs) is one method that could be used, as it is a spatial indicator that describes urban regions through the assessment of land use, physical properties and environmental characteristics (Réquia Júnior et al., 2015). The UST method assesses the morphology of housing, green spaces and industrial buildings which can be compared, to assess the relationship with a health risk (Réquia Júnior et al., 2015). Like other global health problems, air pollution is complex. It is not unique to one region because it reaches across borders. As a result, governments and organizations from various regions need to work together to mitigate this problem. Designing and Building for Health, Well-Being, and Sustainability. Washington: Island Press. 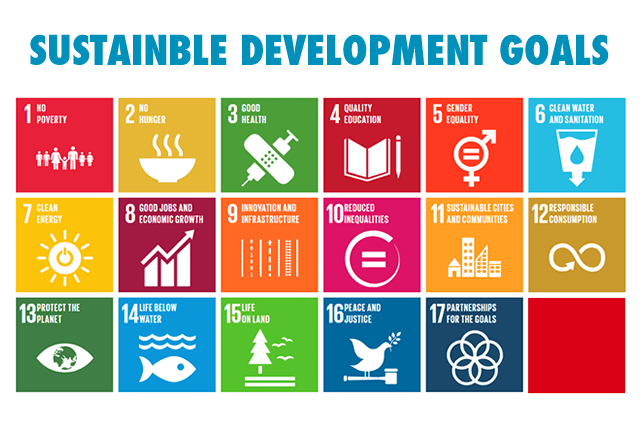 In September 2015 the United Nations adopted seventeen sustainable development goals (SDGs) (Figure 1) as part of the 2030 Agenda for Sustainable Development; which aims to end poverty, fight inequality, injustice, and tackle climate change. These SDGs are acknowledged as going beyond the previous Millennium Development Goals (MDGs) as they aim to address, ‘The root cause of poverty and a universal need for development that will work for all people’ (United Nations, 2015). Each of the SDGs relate to health and wellbeing with aims, approaches and principles that are concomitant to the discipline of health promotion; a discipline that acknowledges the complexity of health and is based on the principles of human rights, equity and empowerment (Williams, 2011). Consequently, such principles imply that health promotion is an effective approach toward achieving the SDGs. This approach is supported by the global framework and described in “The Ottawa Charter for Health Promotion” (WHO, 1986) (Figure 2) which identifies five key action areas: building healthy public policy, creating supportive environments, strengthening community actions, developing personal skills and reorientating health services through advocacy, enabling mediation for effective practice. An example of a collaborative initiative that illustrates health promotion as defined in the Ottawa Charter is the International Network of Health Promoting Hospitals & Health Services (HPH). The initiative works to reorient health care towards an active promotion of health for patients, staff, and communities. Further detail on the approach can be accessed on the HPH website. The principles and actions illustrated alongside the interdisciplinary approach of health promotion that empowers people and communities (Health Promotion Forum of New Zealand, 2014) and focuses on equity and the broader determinants of health (Davies, 2013) is acknowledged by the World Health Organisation, “Health promotion programmes based on principles of engagement and empowerment offer real benefits. These include: creating better conditions for health, improving health literacy, supporting independent living and making the healthier choice the easier choice” (WHO, 2013 p 16). The value associated with the approach clarifies how health promotion can effectively contribute to achieving the seventeen SDGs where the SDGs can guide the delivery of effective health promotion to improve health, wellbeing and personal development throughout the global community. Clinical Health Promotion Centre. The International Network of Health Promoting Hospitals & Services. http://www.hphnet.org/ Accessed 22/1/2016. Bispebjerg University Hospital Denmark. Davies, J.K. 2013. Health Promotion: a Unique Discipline? Health Promotion Forum of New Zealand. Health Promotion Forum of New Zealand. 2014. http://www.hauora.co.nz/defining-health-promotion.html#sthash.5sStc8VF.dpuf. Williams, C. 2011. Health promotion, human rights and equity. Keeping up to date. Health Promotion Forum of New Zealand. World Health Organisation. 1986. The Ottawa Charter for Health Promotion. WHO. WHO (2013) Health 2020: a European policy framework and strategy for the 21st century Copenhagen, World Health Organisation. As a concept, health promotion is not new as aspects of its approach can be traced back to ancient Greece. Since then it has continued to develop into an effective approach to address global health challenges. Developments within health promotion date back to the beginning of the nineteenth century when there was an increased awareness of health promotion principles and an increased recognition that health was influenced by poverty and living conditions. The 1940s then observed the term health promotion being defined and the approach being used by the medical historian Henry E. Sigeres, who identified four related health promotion tasks within the field of medicine, namely the promotion of health, prevention of illness, restoration of the sick, and rehabilitation (Kumar & Preetha, 2012). During the 1970s there was increased recognition that merely concentrating on increasing the capacity of health and medical services was not effective. Such recognition was significant for the health promotion field as this was the first acknowledgment that medical services alone could not improve health. Such challenges were recognized by Marc Lalonde, the Canadian Minister of Health, which resulted in the 1974 publication of “A New Perspective on the Health of Canadians” later known as the Lalonde Report (Lalonde, 1974). The report’s findings were momentous for health promotion as it emphasized that social structures influenced health and suggested that health care was not the most important determinant of health. With increased recognition of the link between health and social determinants of health a conference was held by the World Health Organisation (WHO) and the United Nations Children’s Fund (UNICEF) during 1978 in Alma Ata, Russia. An outcome of the conference was a declaration signed by 134 world health ministers with a goal of Health for All by the year 2000 that would be achieved through the provision of universal primary health care. This became known as the Alma Ata Declaration, and was the primary international policy initiative for WHO (Godlee, 1994) that is considered by some as the founding framework for health promotion. Such acclaims are a response to the significant statements positioned within the report, namely a comprehensive definition of health, recognition of health as a human right, and the unacceptability of inequalities in health. The report also identified that primary health care was key to improving health and reducing health status inequalities alongside providing a clear political understanding of health (WHO, 1978). Such statements have resulted in Alma Ata being identified as ‘the foundation for the evolution of modern health promotion’ (Kickbusch, 2003). Alma Ata was followed by a number of international WHO conferences during the 1980s when declarations were written and WHO Europe undertook a programme of work that identified health promotion concepts and principles (WHO, 2005). The result was health promotion emerged as a broader concept and an approach that recognized that identifying individuals as responsible for their poor health without acknowledging the structural determinants of health resulted in victim blaming (Tones, 1986). This new health promotion approach increasingly acknowledged that people’s health seeking behaviour was influenced by societal norms and socioeconomic position (Goodman et al., 1996). Such ideology influenced and informed the first international health promotion conference in Ottawa, Canada from which the Ottawa Charter was produced (WHO, 1986). 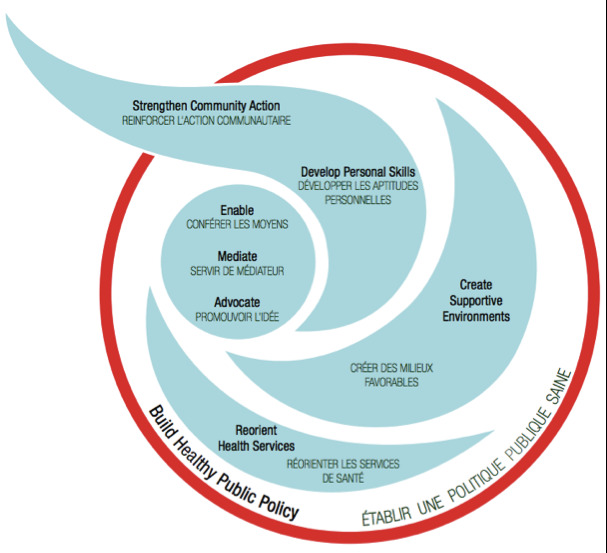 The Ottawa Charter defined health promotion and is a framework for health promotion that identifies prerequisites for health alongside key actions and approaches for health promotion practice. Through the charter’s strategies of action, namely the building of healthy public policy, creating supportive environments, strengthening community action, developing personal skills, and reorienting health services (WHO, 1986), it aimed to operationalise the Alma Ata principles. As a result the Ottawa Charter contributed to the birth of the ‘new public health’ and identified a role for health promotion, placing it alongside disease prevention and health protection (Sparks, 2013) and by defining health promotion, it has augmented both its recognition and progression to an academic subject. The result of which is increased tertiary education opportunities, research, and texts with a theoretical basis that informs effective practice (Murphy, 2005). Health promotion was later strengthened by the Commission on the Social Determinants of Health 2008 report “Closing the Gap in a Generation: Health Equity Through Action on the Social Determinants of Health” (WHO, 2008) which provided further evidence on the requisites for health equity and the necessity to address the structural factors affecting health and well-being (Crouch & Fagan, 2014). Since the Ottawa Charter there have been a number of international treaties, declarations, and frameworks that continue health promotion developments. Alongside a series of conferences on health promotion continue to develop health promotion globally, such as the Adelaide Conference on Healthy Public Policy (1988), Sundsvall Statement on Supportive Environments (1991), Jakarta Declaration on Leading Health Promotion into the 21st Century (1997), Mexico Ministerial Statement for the Promotion of Health: From Ideas to Action (2000), The Bangkok Charter for Health Promotion in a Globalized World (2005), Nairobi Call to Action (2009) and Helsinki Health in All Policies (2013) (WHO, 2015). Such developments have resulted in the transformation of health promotion as an approach that uses a range of models, strategies and approaches to improve health and wellbeing. It has moved it from a behaviour change focus to a comprehensive socio-environmental model (Harris & McPhail-Bell, 2007) resulting in a contemporary approach with a knowledge base and practices that reflect a paradigm shift in our understanding of health resulting in health promotion developing into a field of study in its own right (Davies, 2013). This contemporary health promotion has been identified as ‘one of the most ambitious health-related enterprises of the 20th century’ (Carlisle, 2000). It has also been identified as a visionary approach due to its global concern for equity, justice, the environment and its multi-faceted approach of working in partnership across sectors and disciplines (WHO, 1997) extending the role of health promoters to one that is increasingly broad and diverse requiring an increased body of skills to address global, public health issues. Such diverse knowledge and skills are increasingly recognised and informing international development related to competencies and regulation of the health promotion workforce (Barry, 2009), escalating the recognition of health promotion within the wider public health workforce. It is timely for us to celebrate the journey undertaken by health promotion and recognise its role in reducing inequities and addressing the global health challenges that we face. Well done health promoters! Barry, M. M. (2009). The Galway Consensus Conference: international collaboration on the development of core competencies for health promotion and health education. Global Health Promotion. Vol 16. 2: 05-11. Carlisle, S. 2000. Health promotion, advocacy and health inequalities: a conceptual framework. Health Promotion International. Vol. 15. 4: 369-376. Crouch, A., & Fagan, P. (2014). Are insights from Indigenous health shaping a paradigm shift in health promotion praxis in Australia? Australian Journal of Primary Health;, 20, 323-326. Davies, J. K. (2013). Health promotion: a unique discipline. Health Promotion Forum of New Zealand.Godlee, F. (1994). WHO in retreat: is it losing its influence? British Medical Journal. 309:1491. Goodman, R.M., Wandersman, A., Chinman, M. Imm P. and Morrissey E. (1996).An ecological assessment of community-based interventions for prevention and health promotion: approaches to measuring community coalitions. American Journal Community Psychology. American Journal of Community Psychology. Feb: 24 (1): 33-36. Harris, N., & McPhail-Bell, K. (2007). Evolving directions in health promotion workforce development. Health Promotion in the Pacific, 14(2), 63-65. Kickbusch, I. (2003). The contribution of the World Health Organization to a new public health and health promotion. American Journal of Public Health. March 93 (3) 383-388. Kumar, S, & Preetha G.S. (2012). Health promotion: An effective tool for global health. Indian Journal of Community Medicine. International Institute of Health Management Research. Lalonde, M. (1974). A new perspective on the health of Canadians a working document. Government of Canada. Murphy, J. (2005). Health promotion. Economic roundup. (Winter ed.) The Treasury, Australian Government.Sparks, M. (2013). The importance of context in the evolution of health promotion. Global Health Promotion, 20(2), 74-78. Tones, B.K. (1986). Health education and the ideology of health promotion: A review of alternative approaches. Health Education Research. 1:3-12.
WHO. (2005). Milestones in health promotion: Statements from global conferences. http://www.who.int/healthpromotion/milestones_yellowdocument.pdf.